The Skilled Nursing staff at Mt. 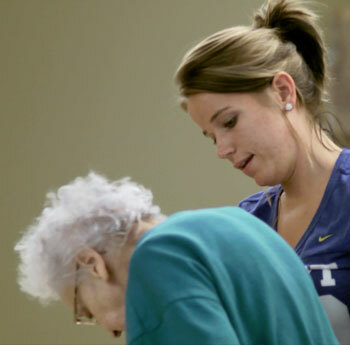 Carmel is committed to preserving the dignity of every person for whom they provide care. The physical, social, emotional and spiritual needs of each individual are considered foremost in their minds. Licensed as a Nursing Care Facility by the Pennsylvania Department of Health, Mt. Carmel has 121 beds and combines the skills of Registered Nurses, Licensed Practical Nurses, Certified Nurse Assistants and Therapists to offer the full spectrum of compassionate care to all residents. Medical Director services are also available onsite. The best part about my job is taking the residents’ clothing back to their room. I go in with a smile, a conversation. If I can make them laugh it makes my day.